What Is an 8K Camera? An 8K camera is a digital camera that can take still and/or video images in 8K resolution. 8K resolution consists of 7680 x 4320 pixels (4320p - or the equivalent of 33.2 Megapixels). 8K has 4 times the number of pixels as 4K and 16 times the pixels of 1080p. On a technical level, an 8K camera uses a lens and sensor chip to capture the digital image. The digital image is then stored on a memory card or removable hard drive, or outputs the image signal to an external hard drive or a printer, display device, or out through a live broadcast that can be received and viewed. The challenge for camera makers is cramming at least 33.2 million pixels in a sensor chip small enough to fit inside a camera housing (or make a camera large enough for the size of the sensor). There are both still and video cameras that capture images in 8K resolution. Taking still images with an 8K camera is the same as with other digital cameras. In addition to the sensor chip and lens assembly, 8K cameras typically incorporate the same setting options as other cameras, such as auto and manual focus, exposure, aperture, and shutter speed. Depending on the brand and model, you may also be able to take pictures at resolutions lower than 8K. Although a camera may be able to take 8K still images, or a series of still images in quick succession, the requirements for taking moving video images is more complex. For 8K video images to be viewed on display devices or projected onto a screen, the camera needs to have fast processors that can send the captured images at to a storage device or live broadcast without interruption. This means that the camera needs to move the image data at high speeds (the bit-rate) which may be as much as several Gbps (gigabytes-per-second) depending on if the images are compressed or uncompressed. Also, storage or receiving devices need to be compatible with those incoming speeds. Storage for 8K video needs to be large. 40 minutes of 8K video may require as much as 2-Terabytes of storage or more depending on whether RAW or compressed. 8K TV – With the trend towards larger TV screens, 8K resolution video still and video images are well suited for TVs 85-inches and larger. Cinema display – Image quality that is closer to 35mm film than the 2K and 4K digital cinema cameras and projection systems used in cinemas. Digital Signage – Digital billboards, retail displays, and both large indoor and outdoor displays that look as smooth as images on a TV or projection screen. Live Events – Although not broadcast in 8K, 8K cameras have been used in events such as the Super Bowl. They will also be used for the 2020 Olympics. Medical imaging – Provides the detail needed for precise imaging of medical conditions. Space and Astronomy – 8K imaging capability can provide more detail for telescope and space probe cameras. Guardians of the Galaxy Vol. 2 was the first movie shot using an 8K camera. Several companies make 8K-capable still image cameras, including Canon and Nikon. Sharp, Sony, Ikegami, and Red are the major players in 8K video cameras. 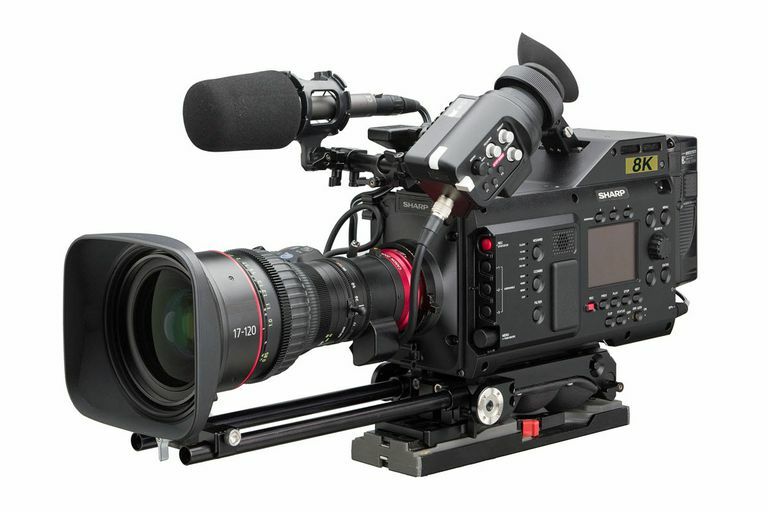 Red and Sony cameras are primarily used in cinema production, while Ikegami and Sharp cameras are primarily used in production where the content is, or eventually be used in streaming or TV broadcasts. Are 8K Cameras For Sale? 8K-capable still cameras are available for consumers if you have the cash ($3,000 to 5,000 or more when you include the camera and additional lenses), but 8K video cameras are currently reserved for professional use and are very expensive, priced at $50,000 or more. Sharp is developing an 8K video camera with a less than $5,000 proposed price point, so hopefully more manufacturers will follow.